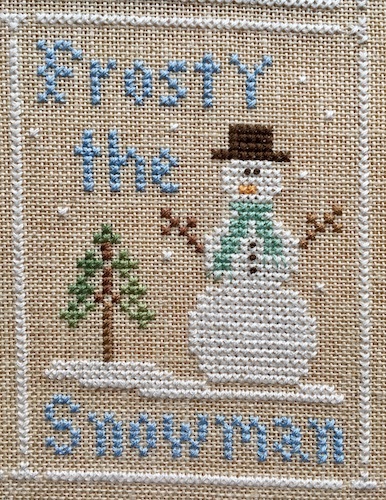 This is the scheduled three-weekly post for the SAL that I’m doing with several other crafty blogs and Snowflake Serenade is finished! This is the final box, which I’m calling The 12 days of Christmas as the birds look like they might be the 2 turtle doves. And this is the finished piece. I think I completed this in record time (for me) so I’m chuffed to bits. I’ve got the next project ready to go and hopefully will have some progress to show you in three weeks. 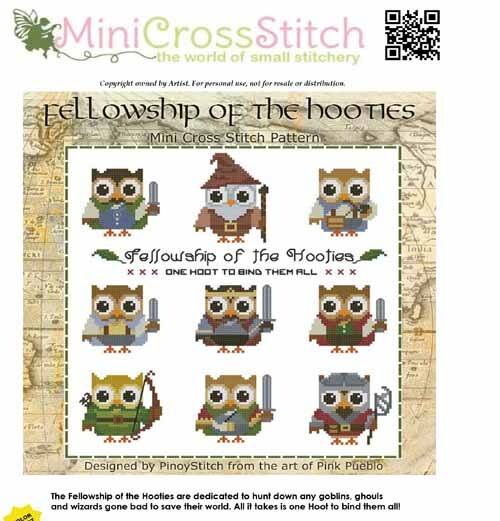 Do allow for people being in different time zones, so not posting all at the same time, but it’s well worth doing a bit of blog hopping to see all the lovely projects that are being worked on. 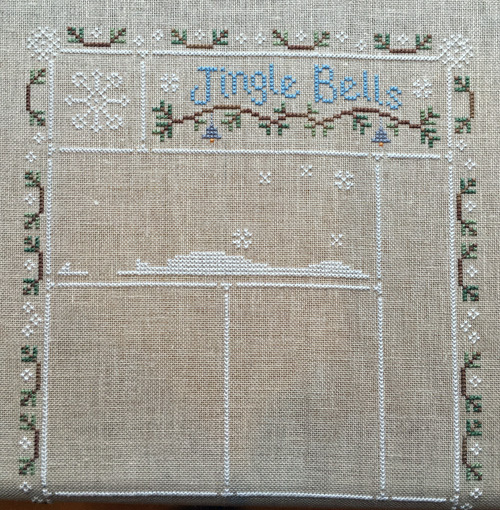 Categories: Country Cottage Needleworks, Cross stitch | Tags: Country Cottage Needleworks, Cross Stitch, Snowflake Serenade | Permalink. 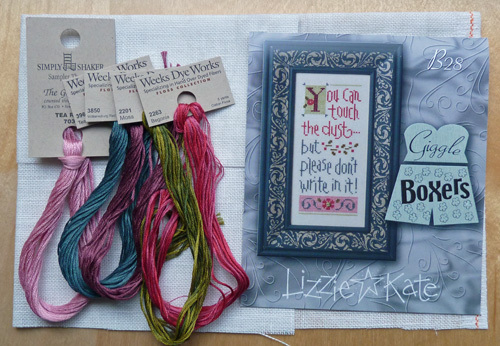 This is the scheduled three-weekly post for the SAL that I’m doing with several other crafty blogs and I’ve managed to fill in two more boxes as well as finishing the one that I’d started. This is how it looked at the last update. 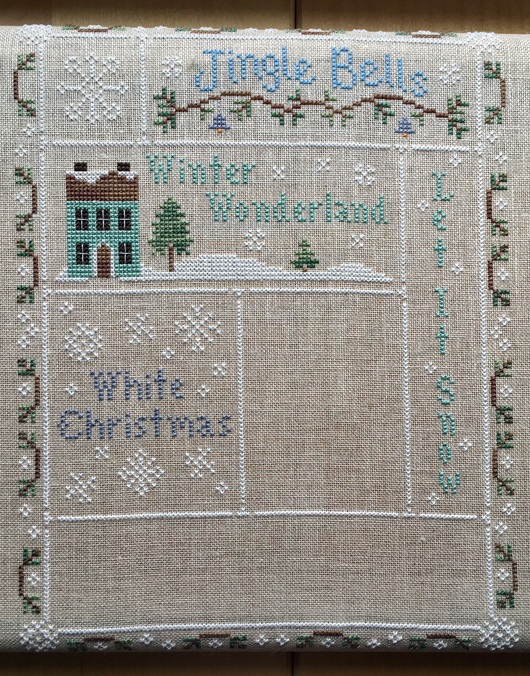 This is Winter Wonderland, which I’d made a start on before. I may redo the small tree if I have enough green thread left at the end. It’s a variegated thread and when I did the large tree I dotted the stitches about a bit to get a mottled look but for the small one I didn’t, and it looks a bit odd. I’m not sure how the two WDW threads are going to hold up as there’s a lot more green and brown still to do, but I’m crossing my fingers. Let it snow didn’t take long at all with just a bit of text and a handful of snowflakes. Finally for this update is White Christmas. The snowflakes took some concentration to get right but the box didn’t take too long to do. You can see why it’s called Snowflake Serenade now, can’t you. 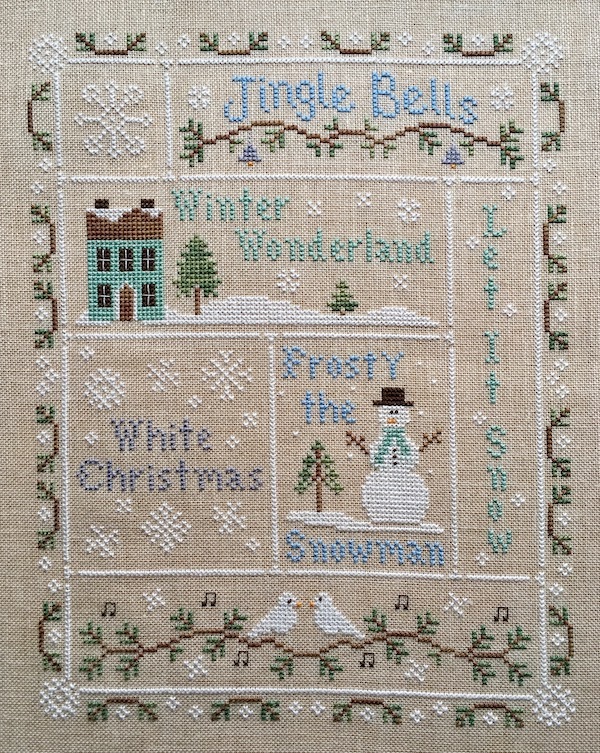 I’ve had Christmas carols going round in my head while stitching! This is what it looks like now with just two boxes left to do. Those last two boxes are more detailed and have a lot more in than the last couple but I’m hoping for a happy dance next update. 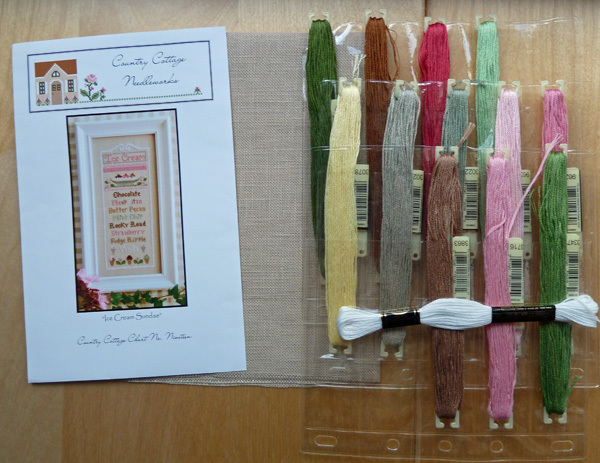 This is the scheduled three-weekly post for the SAL that I’m doing with several other crafty blogs and I’ve managed to fill in two of the little boxes plus a bit into box three. This is how it looked at the last update, with the outline and border completed. This is box one with the pretty snowflake. This didn’t take long, although it took a bit of concentration to get it right. This is box two with a few different things in it. I really enjoyed doing this one. I also made a start on box three, with most of the snow done. I’ll have this box finished for next time, hopefully with box four too. This is how it all looks at the moment. Huge apologies for missing Jocelyn off the last update. That’ll teach me to check my email a bit more frequently! 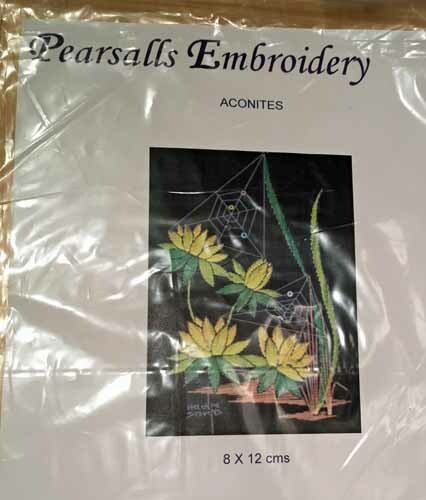 This is the scheduled three-weekly post for the SAL that I’m doing with several other crafty blogs and after the happy dance last time, I get to start a new project. 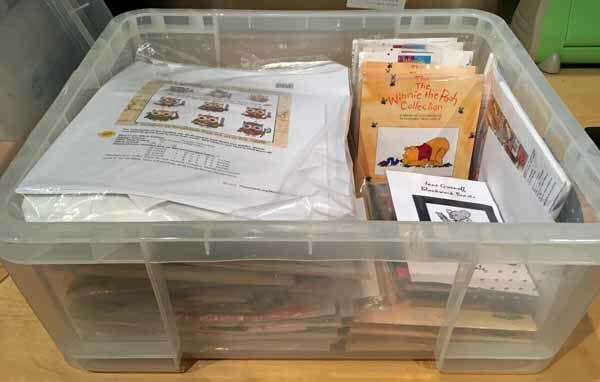 I had a good sort out of my To Be Stitched box and five different projects shouted loudly enough to be freed, that I’ve pulled them out and am hoping to do them all this year. 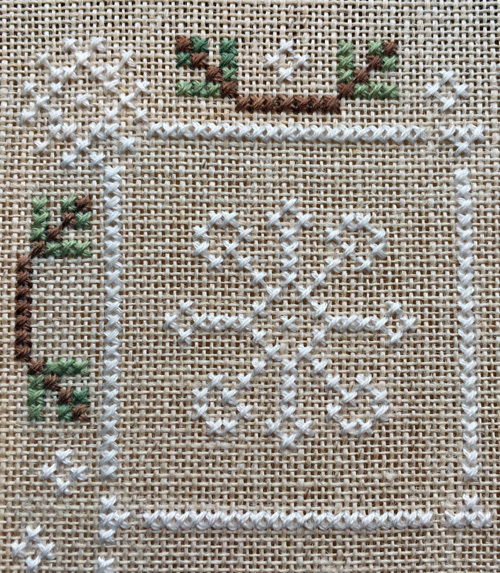 (I know, very optimistic given my recent track record LOL) Apart from one, they’re all fairly small, although one isn’t cross stitch and looks a little bit scary. 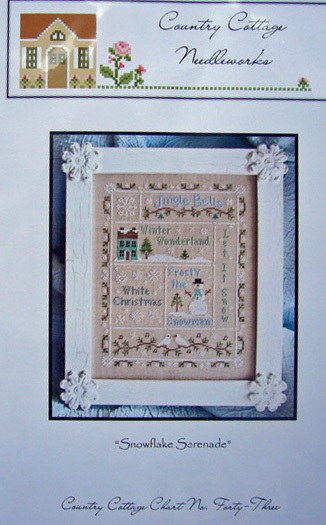 This one is by one of my favourite designers, Country Cottage Needleworks, and is called Snowflake Serenade. I’m using the recommended threads and I’ve picked a fabric from my stash that I think goes nicely. 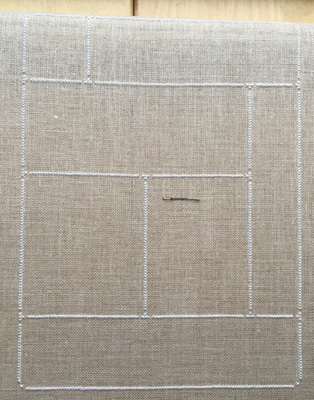 It’s a 28 count Permin Linen in Lambswool. It’s nice and slubby – lovely! This is the stash and the picture of how it will eventually look. I’ve had this chart in my stash for at least four years. I know this because I’d already taken the stash photo and it was dated 01/01/15. 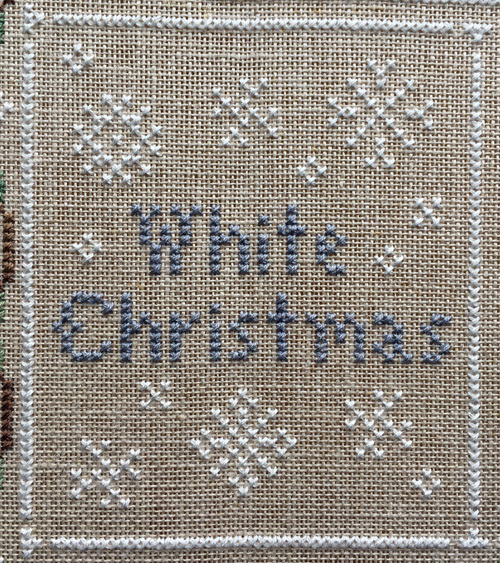 I thought it’d be lovely to do at this time of year and it’ll be much simpler and quicker than the last project. I thought it’d be fun to start off by doing the outline first, as then I could have fun filling in the boxes. This proved to be a bit more troublesome than I’d anticipated as apparently, I can’t count. I was about halfway done and I had to frog a fair bit of the top as I’d missed seeing one of the very fine threads that you get in slubby linen and was half a stitch out. Once I’d put that right, I found that it was a whole stitch out for most of what there was left so that got frogged and redone. I bet you can guess how many times I counted, checked, and counted again after that, but the rest got done without any mistakes. Look how many of us there are now! We’re getting more people join us all the time and it’s great to see their progress posts every three weeks. That didn’t take long, did it. I’m rather pleased with it too. I’m not sure how I’m going to frame it yet. 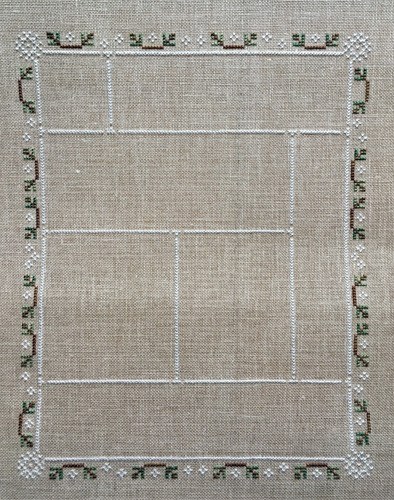 It’ll probably be with fabric as it’s an awkward size for a wooden frame. Next I’m going to do some work on one of my WIPs from last year. Then I might have a go at Crazy Cat Lady. Looks like the urge to stitch is finally back. 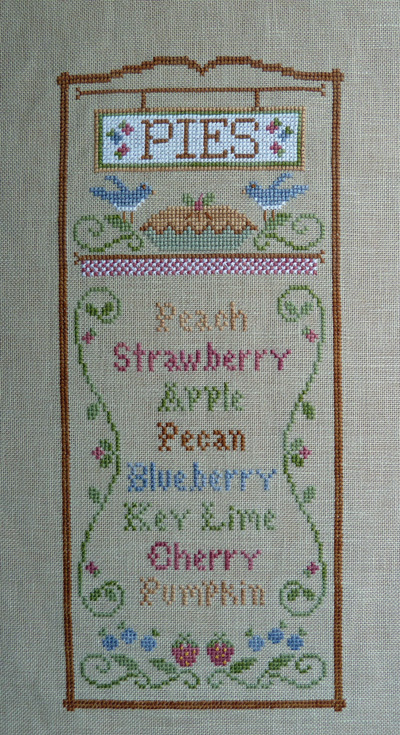 Categories: Country Cottage Needleworks, Cross stitch | Tags: Country Cottage Needleworks, Cross Stitch, Pie Menu | Permalink. Just tearing myself away from my lovely new sewing machine for long enough to post a quick update on Pie Menu. I’ve been stitching away in the evening, still while watching Stargate Atlantis, and have all the bits around the outside finished now. All I have left to do is list all the yummy pies so hopefully it won’t take long. 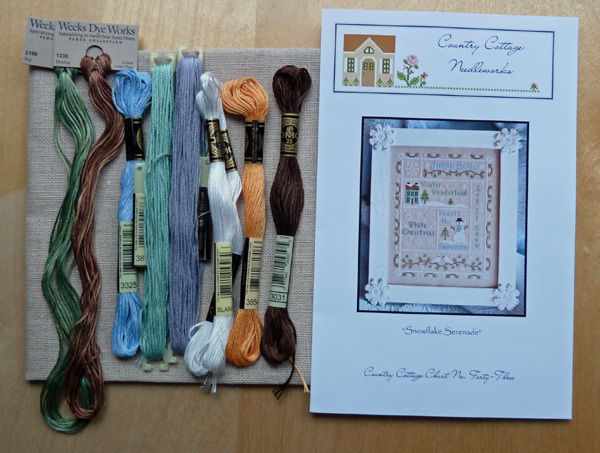 Categories: Country Cottage Needleworks, Cross stitch, Food and Drink | Tags: Country Cottage Needleworks, Cross Stitch, Pie Menu | Permalink.